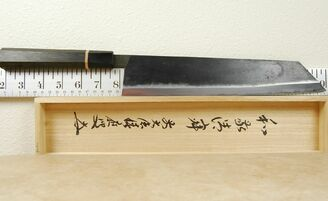 The 270mm AS Kiritsuke is a double-beveled and symmetrically ground blade. Classic Japanese kiritsukes are single-beveled knives. 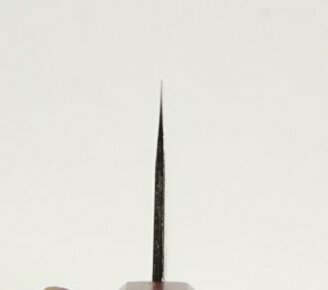 Using a double bevel enhances durability to the edge and gives an ambidextrous personality to the blade overall. This style of blade is perfect for push and pull cutting, plus the flatter edge makes it a good substitute for a slicer. 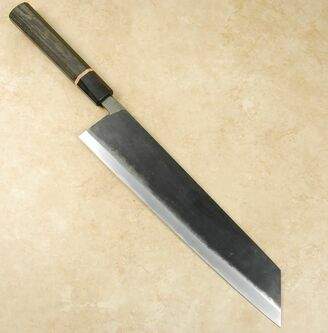 The knife will be a favorite with cooks who do a lot of protein work and veggie prep, as well as those who like to push rather than rock through large ingredients. We have a very limited number of these fascinating blades that we are making available with our exclusive bog oak custom handles made by Isaiah Schroeder. My knife came fast and was packaged well. 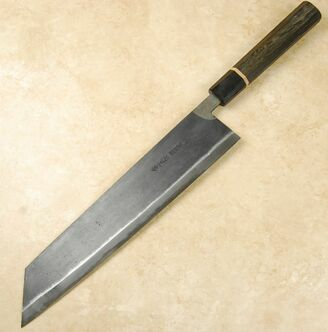 The Moritaka blade quality is as expected. The handle is legit and the install appears seamless. Extremely happy. Thanks! Great knife ,the OTB edge was a 5 out of ten but a quick trip to the stones and it was a soild 10 . As far as the blade goes good fit and finish. The edges on the spine and choil could use a little rounding off but its a small thing in what is overall a great knife for the money. The custom handle is an excellent piece of work by Isaiah , the handle install is excellent as well , this is the second knife I've purchased from CKTG with a custom handle , if your thinking of getting one i highly recommend it ,you won't be disappointed. As always lighting fast shipping from CKTG .